In 1972 after an extensive research and development Amsoil produced the worlds first 100% synthetic motor oil for on the road vehicles. 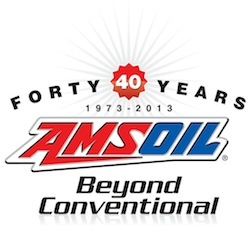 40+ years in the business, Amsoil has earned the most respectable track record in the world. Below you can take a look at the Federal Trade Commission's (FTC) web site for all the lawsuits and settlements for false and deceptive advertisements by major motor oil and oil additive manufacturers. Amsoil shines like a star amidst companies which only care about profits not the environment nor the consumers like you. Is Amsoil's Claims True or Just Another False and Deceptive Advertisement? Does AMSOIL really do what it says it does? Change your oil every 25,000 miles (40,000 Km's)? Every place you have read says to do it every 3000 miles (5,000 Km's). What are Amsoil problems, Any FTC Charges? Hypothetically let's say Amsoil didn't deliver as promised. Let's also assume for one minute that it's a lie, crazy, false and deceptive advertising. Don't you think for a minute that Mobil, Royal Purple, Redline, Castrol, Shell Oil or Exxon wouldn't be all over Amsoil in a court of law suing for FALSE ADVERTISING? Amsoil being 3rd largest selling synthetic lubricants in North America. Obviously if there is a way oil companies would like to see their competition to go out of business. If the back of the bottle of Amsoil Signature Series says, "extended drain intervals for up to 25,000 miles (40,000 km's) or one-year" don't you really think that the oil should be GUARANTEED to last that long? And if not, wouldn't there be a class action lawsuit against Amsoil after thousands of people from all over the USA and Canada would complain about problems? Amsoil never misleads consumers with false and deceptive advertising campaign just to sell their products. The fact is that Amsoil stands apart from every other motor oil company in the world, 40 years in business and there is not ONE single FTC charge for deceptive advertising for AMSOIL. Be an informed consumer Click here to search the FTC web site for Amsoil. Which Motor Oil Would You Choose? If you still want to do something to evaluate the integrity of Amsoil and its products, Please forward this web site to all the global leaders in motor oil manufacturing including the one you are currently using and ask them to prove us wrong or recommend a better product for your vehicle. If what we claim is not true, certainly this web site will not be in service instead be at the FTC board for review! It's as simple as that!